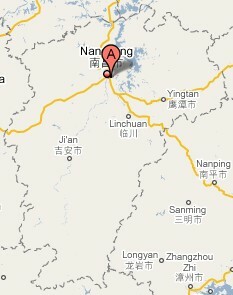 Jiangxi Province lies in the southeastern part of China, on the southern bank of the middle reaches of the Yangtze River. Situated 24"29"-30"05" north latitude and 113"34"-118"28" east longitude, it has an area of more than 160,000 square kilometers. It is bordered by hills and mountains, with the land generally sloping towards the Poyang Lake in the north. Hills and mountains exceed 60% of the province's total area, mainly lying in the west, east and south. Jiangxi has a sub-tropical climate, warm and humid. It has a mean annual temperature of 16oC-20oC -- the hottest month, July, averaging 28-30oC and the coldest month, January, 4-9oC -- and a mean annual precipitation of 1,300-1,800 mm. It is divided into 11 prefecture-level cities, 10 county-level cities and 70 counties, with a population of 41,40 million by 2000, mainly ethnic groups of Han, Miao, Hui, Yao and She. Crunchy candy, stone fish, rock tripe, and chukar, etc. Jiangxi (literally means west of river), called Gan for short, lies to the south of the Yangtze River valley, and is named for being situated west of the Ganjiang River. Jiangxi Province is rich in mineral deposits. Tungsten ore, copper ore, lead ore, zinc ore, and rock salt are the main minerals in the province. It is a major producer of rice, mandarin orange, tea and freshwater fish. The province is also famous for its local traditional products: china made in Jingdezhen, porcelain pictures made in Nanchang, Qianshan bamboo handcraft, tealeaves from Lushan Mountain, and bamboo shoots in Jinggang Mountain, etc. Jiangxi Province has many beautiful mountains, rivers and historical relics. Lushan Mountain, Sanqing Mountain, and Longhu Mountain are among the most famous mountains in China. It is a province with glorious revolutionary history; its places of historic interest include Jinggang Mountain, Ruijin, Nanchang and Anyuan. Lushan Mountain, famous for its elegance, steepness and oddness, with its main peak at 1,474 meters above sea level on the lakeshore, is a famous tourist spot. The Bailu Academy was one of the Four Great Academies of Classical Learning in the past. The highlight of Jiangxi travel should be Jingdezhen, which is known as the "Capital of Porcelain" in China. Porcelains were produced here as early as 1,800 years ago in the Eastern Han Dynasty (25-220). Today, Jingdezhen remains a national center of porcelain production.